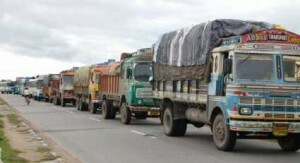 Freight rates for 9-tonne load for select destinations edged higher by INR 500 at the local truck transport market today on pick-up in cargo movements against tight availability of trucks. Transporters said increased cargo movements against tight availability of trucks mainly led to the rise in select centres’ freight rates. Freights from Delhi to Patna, Ahmadabad and Surat were up by INR 500 each to INR 25,500, INR 20,500 and INR 25,500, respectively. Jaipur-14,000, Hyderabad-56,000, Chandigarh-16,000 Vijayawada-58,000, Ludhiana-17,000, Bangalore-64,000 Kanpur-18,000, Chennai-63,000, Indore-19,000, Mysore-68,000, Ahmedabad-20,500, Pondicherry-64,000, Baroda- 22,000, Coimbatore-69,000, Patna-25,500, Kochi-74,000, Surat-25,500, Thiruvananthapuram-77,000 Mumbai-26,500, Goa-51,000, Pune-28,500, Gwalior-13,000, Kolkata-29,500, Guwahati-52,000.